1. Cook the potatoes in boiling water for 12-15 minutes until tender then drain. 2. Meanwhile, heat the oil in a large frying pan, and fry the sausagemeat, broken up into chunks, and onion for 5 minutes (check the sausagemeat is cooked through with no pink meat). Add the apple and cook for a further 3 minutes. 3. Cook the kale in boiling water for 3-4 minutes, then drain well. 4. 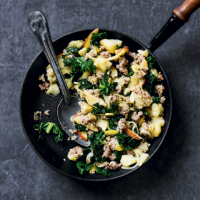 Add the potatoes and kale to the sausagemeat, and fry for 1-2 minutes, breaking up the potatoes with the back of the wooden spoon or potato masher. Season to taste.